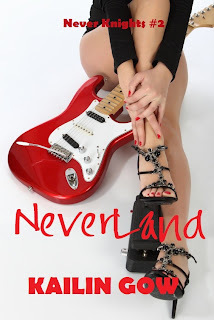 Welcome to Never Land, the land of Never and the world of rock, the world of new experiences and sensations, a world where music runs through the veins of the dedicated, and love is taken and given with consequences. Never (Neve) Knight, the lead singer and manager of a band filled with the hottest guys in rock finally gets the dream that she wanted: a label signing her band The Never Knights. It is what she always wanted, a band of her own, playing her own kind of music. Getting her band to where it was came at a high price, including giving up the man who made her heart race and her blood pound, the man that caused her to nearly lose her band. As she gets ready to go on her world tour, fate brings her close to Danny Blue again, and she's not sure if she can give him up a second time even if it means losing the band. Kailin Gow's promising sequel to Never Say Never is just what the doctor ordered! Never Land follows the Never Knights to London where Danny Blue's past makes trouble and the band is put through the ringer. To say there's more drama is not saying enough, because every page is filled with emotional confessions or tense confrontations. The plot is shocking and slightly darker, but makes for a very enticing read. Never Land delves much deeper into Never's experience with her ever-growing celebrity status. Now that the Never Knights are opening shows, the challenge and pressure to keep it together increases. The worries she faces are real, more serious, and more than what a young woman should experience. The story doesn't focus so much on the everyday lifestyle of young rock stars as it does the band's reactions to what's in store for them or their struggle to make it big. There are a few scenes that give you a feeling of what it might feel like to be in the limelight, but the story primarily revolves around Never and her struggle to keep the band intact. Kailin's characterization takes on a whole new level as the dark secrets of Danny's past make an appearance. Danny is seen in a new light and his relationship with Never remains fragile. The other band members, Luc, Kyle, Steve and Geoff are present but it seems that they're pushed to the background a lot more when Danny comes around. So much happens in this novel that will not be expected but Kailin works it in naturally. This series will undoubtedly continue to take surprising twists that should not be missed! This series is new to me. Thanks for the introduction and your thoughts. I'm not sure it is a book for me but appreciate your post.